Municipal government can become more flexible, transparent and adaptive to citizen needs. That core belief informs my approach to the Office of the Mayor and the decisions I make every day on behalf of the community I serve. My only requirements are that we provide excellent, effective, and efficient services. I want to know: How can we better engage people? Are we accountable? Is this affordable? Really, though, our singular focus is making Spokane the “City of Choice” for the Northwest and we are working hard toward that goal. We are a leaner, more efficient operation today as we bring services closer to citizens, drive greater accountability, and save tax dollars. There is much work still to do, and I need to hear from you. You are an important voice as we deliver services we can afford and develop a safe, livable community full of the opportunities that makes us call Spokane our home. Born the same year that Spokane was preparing to shine on the global stage at Expo '74, Mayor David A. Condon grew up in a community that was safe for families, fertile for businesses, and naturally stunning. After graduating from Gonzaga Prep, he went on to earn his bachelor's degree in Finance and Military Science from Boston College. The first re-elected Mayor in Spokane in more than 40 years, Mayor Condon remains focused on many key initiatives which began during his first term – all aimed at making Spokane safer, smarter, and healthier. These include making major investments in public safety, improving streets, growing jobs and our economy, crafting an affordable budget, leading in developing innovative infrastructure, and increasing the quality of life. Prior to becoming Mayor of the capital of the Intermountain Northwest, Mayor Condon's distinguished professional career included serving in the US Army, owning and operating small businesses, and serving as the Senior Staff in the US House of Representatives. He was selected as an Aspen Institute Roedel Fellow with a small group of colleagues around the country for values-based leadership and exchange of ideas. 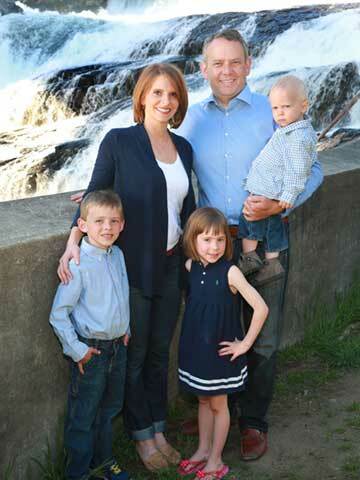 Mayor Condon and his wife, Kristin, are thrilled to be raising their three children near many of their family members in Spokane – which was recently named an All-America City for the third time. He is committed to making sure Spokane grows and is the City of Choice. Born the same year that Spokane was preparing to shine on the global stage at Expo '74, Mayor David A. Condon grew up in a community that was safe for families, fertile for businesses, and naturally stunning. After David graduated Gonzaga Prep, he went on to earn his bachelor's degree in Finance and Military Science from Boston College and was commissioned a Second Lieutenant, Medical Service Corps, United States Army Reserve, Active Duty. The first re-elected Mayor in Spokane in more than 40 years, Mayor Condon remains focused on many key initiatives which began during his first term – all aimed at making Spokane safer, stronger, and smarter. One of his primary concerns has been, and will continue to be, public safety. Overall crime in the City of Spokane has decreased by 19% since 2012, he has initiated reform of Spokane's police culture, redefined the fire and emergency services model, and assisted with the opening of the Domestic Violence Family Justice Center to combine advocacy, investigation and prosecutorial resources in a single, victim-friendly location. Economic growth and job development are also top priorities for Mayor Condon. New incentive programs, infrastructure improvements, and a business-friendly customer service model for the City have all been implemented to help grow Spokane’s job and development markets. Among the most significant accomplishments is the levy delivering $500 million in street improvements over 20 years, and the bond that is making the most significant improvement in Riverfront Park in more than four decades. Mayor Condon has continuously invested in creating a strong and stable City budget, with strategic investment in partnerships and services that will help to grow Spokane as the City of Choice. Mayor Condon has also made significant investments in social and housing services, especially for Spokane’s homeless veterans. In 2015 Mayor Condon launched an initiative to end veteran homelessness for good in Spokane. He also prioritized investments in low barrier housing and outcome-based service programs, and placed a strong emphasis on engaging citizens in decision making processes via public meetings, comment periods, and citizen-driven initiatives. 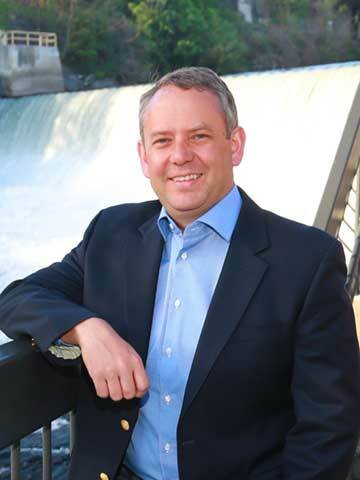 Prior to becoming Mayor of the capitol of the Intermountain Northwest, Mayor Condon's distinguished professional career included serving in the United States Army, owning and operating small businesses, and serving as the District Director for the 5th Congressional District of Washington State. David and his wife Kristin are thrilled to continue to be part of this community, and raise their three children near many of their family members in Spokane – recently named an All-America City for the third time. He is passionate and committed to making sure Spokane grows and is the City of Choice. David Condon earned a Bachelor of Science in Finance and Military Science from Boston College. He was commissioned a Second Lieutenant, Medical Service Corps, United States Army Reserve, Active Duty, on 19 May 1996. He received the Marshall Foundation Award and was a Distinguished Military Graduate. Condon's military education includes the AMEDD Officer Basic Course, the U.S. Army Airborne School, the U.S. Army Air Assault School and the Department of the Navy Transportation of Hazardous Materials Course. CPT Condon served as the Treatment Platoon Leader, Executive Officer for Charlie Company, and subsequently as the Assistant Battalion Operations Officer, 325TH Forward Support Battalion, Schofield Barracks, Hawaii. He deployed on several missions throughout the Pacific including a Medical Readiness Training and Evaluation Mission (MEDRETE) to the Kingdom of Fiji and a rotation at the Joint Readiness Training Center (JRTC). His final assignment in Hawaii was as the aide-de-camp to the Commanding General, Pacific Regional Medical Command. There he participated in the Asia Pacific Military Medical Conference (APMMC) as an administrative officer in New Zealand and Malaysia. He worked with the Veterans Administration on joint ventures with the Department of Defense. He served as the Operations Officer for the 47TH Combat Support Hospital, Fort Lewis, WA which included a rotation at the Joint Readiness Training Center. His final assignment was at A Company, 396th Combat Support Hospital (Reserve) as the Commander, which was activated for Operation Enduring Freedom. Awards and decorations received by CPT Condon include: the Meritorious Service Medal, the Army Commendation Medal with two oak leave clusters, the Army Achievement Medal with two Oak Leaf Clusters, the Overseas Service Ribbon and the U.S. Army Service Ribbon. He received the Chief, Medical Service Corps, Office of the Surgeon General, Award of Excellence for 2000. CPT Condon has been awarded the Expert Field Medical Badge, Parachutist Badge, and the Air Assault Badge. He also received a Certificate of Commendation from the Veterans Administration, Honolulu, HI.